Hear ye, hear ye! I hereby heretofore nominate Twitter Math Camp as the Best Open Conference of 2012 in the Edublog Awards. 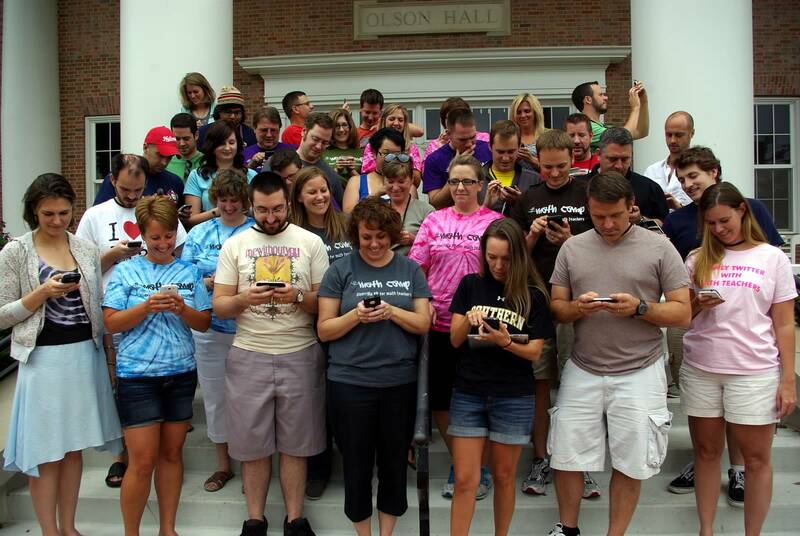 After all, Twitter Math Camp not only had its own hashtag, #TMC12 but also inspired #twitterjealousycamp by those who weren’t with us. Twitter Math Camp consisted of a scrappy group of 40 math teachers from across the Americas. We gathered together in a geographically favorable city (St. Louis, baby!) for three-and-a-half amazing days of learning. That’s us, below. [ED – Lisa reminds me about press for TMC] This amazing conference attracted accolades including Ed Tech Researcher Blog calling us the “Best Twitterblogosphere” and then following up with a post about Twitter Math Camp’s powerful model of teacher-led PD. When most of your Twitter feed is with you, checking Twitter becomes an almost empty action. Many of us blogged about #TMC12 on returning home. Our words in the days following St. Louis speak volumes. Best session idea goes to … My Favorites because I’m pretty sure we could have an entire conference based on that alone and I felt like it was blog reading come to life like a book of pop up bloggers except real. 3 ½ days of working on Exeter Math Problem Sets and sharing with each other. (Here’s the program) We had incredible presentations on a variety of topics. We shared many of our favorite teaching related things – so much so that we adjusted the schedule and scrapped the problem working session on Sunday morning for an hour and a half of additional my favorite things to share. This entry was posted in socialnetworking. Bookmark the permalink. Don’t forget that we got mentioned by the Ed Tech Researcher Blog as the “Best Twitterblogosphere” just prior to the start of TMC12 (http://blogs.edweek.org/edweek/edtechresearcher/2012/07/the_math_blogotwittosphere_is_the_best_blogotwittosphere.html) and then he followed up with a post about TMC12 once we finished (http://blogs.edweek.org/edweek/edtechresearcher/2012/07/teacher_led_pd_overturn_the_narrative_create_something_beautiful.html). Thanks for taking the time to nominate TMC12, Megan, It means a lot to me.